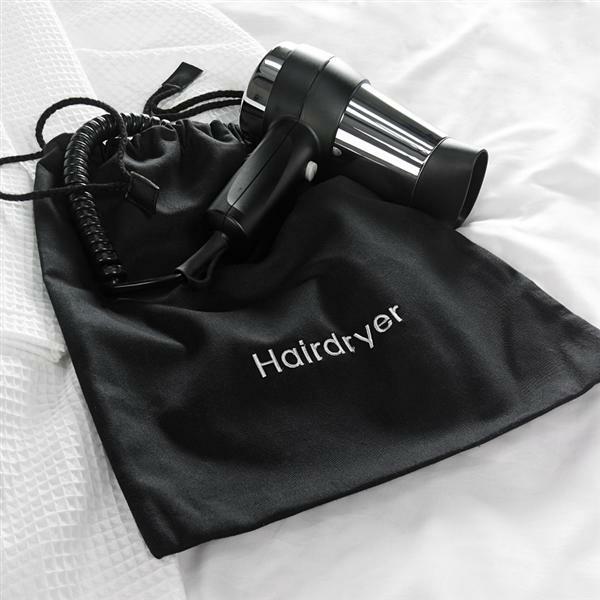 Keeping your hairdryer in a black cotton draw string bag has become a trend in boutique style hotels, so now you can do the same. It's a smart solution with the added bonus of keeping the flex and plug tidy. Excellent quality cotton. They are thick and do the job well. Fast delivery too. Good price and just add a finishing touch. Looks really smart. I hang up the hairdryer next to the robes - gives the room a special touch. Beautiful, cotton, drawstring, Hairdryer bag. Absolutely gorgeous. I had kept my hairdryers in their original boxes but these had become tatty so very pleased with these bags as they look very professional. Useful for keeping the hairdryer tidy. Just what I needed keeps it all neat and tidy in the draw, might be considered a luxury. A very useful way to keep hairdryers tidy (and clean!). The odd guest seems to agree and we have to buy replacements from time to time. Ideal product - makes the drawer look `tidy`, instead of wires everywhere. Cannot think why I did not get one before.